Joel Pomerantz (my partner in this lecture business) talked to us on March 19th, 2015 about his research into the flood of 1862. At first he did not find a whole lot, until he stumbled across the term “freshet”. That opened up a whole new line of research — which led to this wonderful and somewhat unconventional lecture — a “choose your own lecture” adventure: offering a list of topics on which he could speak. He did give some background to start. The term “atmospheric river” is a relatively new one. I hadn’t heard of it myself until I heard a lecture on drought last fall, but it popped up in the news a lot at the start of our winter storm cycle (the threat of which caused more chaos than the actual event this year). These rivers in the sky are actually the delivery mechanism for a lot of moisture from the the equator to landmasses. The moisture isn’t necessarily even visible from space only recently have microwave satellites been able to track them. One of these rivers pushes up toward the northwest, and under certain circumstances, storms in Alaska (the results of other atmospheric rivers) push these rivers further south into California. The total water in these systems can be huge (10 to 20 Mississippi’s worth), and what fell in California in 1862 was exacerbated by a drought in the prior year, and a hard freeze that followed. What measurements we had: San Francisco saw 24”-37” of rain in January alone (19-20 is the average for the year). In gold country there was 108” in a month. All this wrought terrible destruction, pretty much every mill, ferry, and bridge were washed out (many many deaths happened with people trying to cross rivers), tens of thousands of dead cattle washed up on beaches, low lying farms inundated, Sacramento flooded. Newspaper accounts of the time (akin to the blogs of today) had all sorts of accounts of how terrible it was. Every day people thought it could not get worse, and each day it did. A Southern Californian woman recounted how in a 6 week stretch there was not time to dry even a handkerchief. Given the prior year’s drought, sediment got picked up from the ground rather than the water being absorbed — and given also the blasting going on for mining, a tremendous amount of soil and rock was moved and polished by the high fast moving water. Water covered 30’ high telegraph poles in some places and steamships were able to go anywhere. The freeze that followed didn’t stop it. The freeze was a deep one down to sea level, but it didn’t stop the water from moving and ice tsunamis formed — ice piling upon ice, pushing up onto land crushing whatever might be in its path. San Francisco Bay clocked no flood tides for over a week, raised as it was by 7’, and the water was fresh enough that steam ships didn’t have to trek to their usual freshwater streams to get water. The effects did not happen all in one go either. Drought followed in 1863 and 600k more cattle died, pretty much the last of the stock that came from the original Spanish settlements. Michael Barber of UC Davis thinks that this is when native grasslands were supplanted, when new cattle was brought in directly from the east. Tree squirrels may have also taken their place at this time — so many ground squirrels were killed into the floods. The greatest source of information about the floods comes from Sacramento. Governor Leland Stanford was inaugurated on Jan 10th, 1862 and was said to have had to row to the ceremony. Business had to be carried out on the 2nd floor of Sacramento, and 1000s of miners came down from the hills looking for a way back to San Francisco. A fair number of people turned their backs on California altogether. 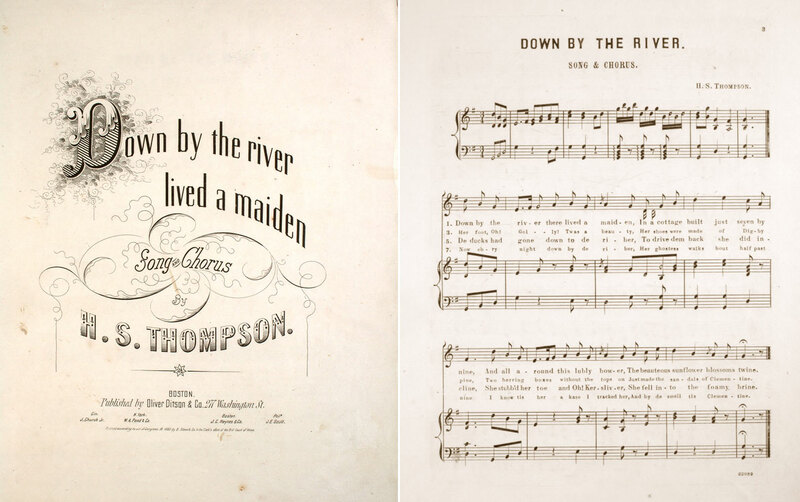 The story quickly made its way into stories and song: Bret Harte’s Luck of Roaring Camp (the story was very successful, the author himself helped rescue people during the floods), a musician Max Zorer who named his songs after the flood (The California Flood Mazurka Dance), and a minstrel song published in 1863 called Down By the River Lived a Maiden, by H. S. Thompson, about a woman who drowns while chasing her ducks away from the river, which later was the inspiration for a song you are all familiar with Oh My Darlin’ Clementine. Joel gave a fabulous rendition of the original — an “old timey” sounding tune, with its amusing but ultimately sad lyrics (sadly my recording of this event failed entirely). Joel had us speculate on why this disaster faded into the background, beyond the terminology, until recently there was little to be found on the subject. 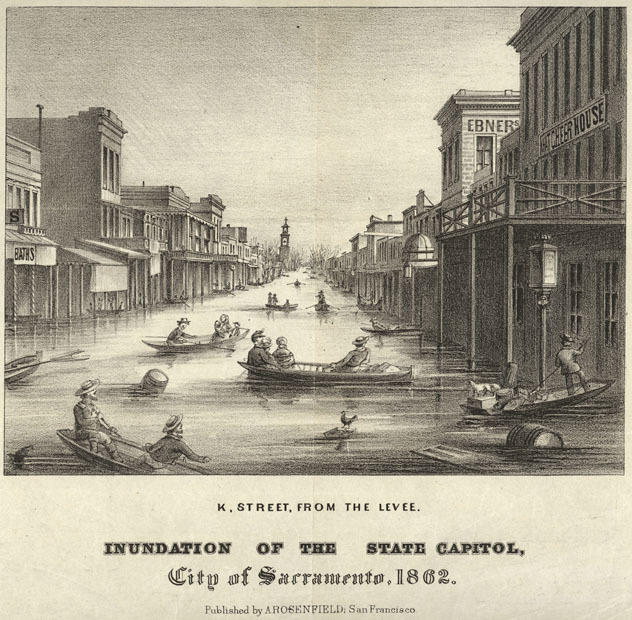 There is some level of time passing — we would not expect much of a history of Hurricane Sandy in 150 years perhaps, except that we are now building on the places that were designed as flood plains in the 1850s. His hypothesis is that it might be the flood control administrators who did not want to talk about it — the storm was of such a magnitude that it is unlikely we could build to it. It’s only recently that people have begun to think about a response (on such effort referred to as the Ark Storm). 16 million people live in areas which were underwater in 1862. How long ‘til the next one? It is really impossible to say. There have been 2-5 storms of this magnitude in the last 2000 years (measuring from sediment layers taken from lakes). Ultimately, it is up to us citizens to remember, research, pass on, and act on this kind of knowledge. At the end of the lecture, I am sure that Joel could have gone on much longer. Keep an eye on http://thinkwalks.org for updates and future talks on his flood research.